Welcome to visit jtfurnace dot com. Please email to jtfurnace at hotmail dot com. Short Bar Heating Furnace is used in the short aluminum bar heating up half homogenization processing, the aluminum bar heating extrusion. Advantages: 1.The equipment is mainly composed by the heating furnace, Conveyor, heating and heated air circulation system, electric control and so on.. 2.Insulation work from the heating furnace set at one, good insulation properties. 3.Without the hydraulic system, does not have the oil leak to catch fire and so on unsafe phenomenon 4.Equipment transmission system simple design .With the efficient production of stability, durability, ease of maintenance, comprehensive performance. 5.Stainless steel conveyor chain, to ensure that prolonged use at high temperatures. 6.The heating fuels may be by fuel oil, producer gas, natural gas, liquid gas LPG, coal and other optional. 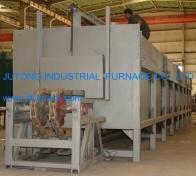 Detailed product specifications, please visit our website jtfurnace com. Our company is specialized exporter, manufacturer and supplier of Heating Furnace For Aluminum Bar in china.